No, I'm not just tormented with the Middle East. I'm lamenting other sufferings, notably the agony of Darfur, where Westerners are not the warmongers for once. Darfur is the west of Sudan. When talking with people I notice that scarce are those who can spot Sudan. In broad outline, it is a vast country in eastern Africa. It starts from Ethiopia and the Red Sea right across Mekka. Then it runs alonside Egypt in the north. It spreads to the west up to Chad, which—while we are on the subject—borders Darfur, and Central African Republic. In the south it runs alonside Congo Democratic Republic (formerly Zaire), Uganda and Kenya. And then it goes upwards along Ethiopia and the Red Sea, so it forever runs around the Nile. Its capital city, Al–Khartum, famous for a few Hollywoodian epics, is planted at the confluence of the White Nile and the Blue Nile. Sudan's problem is not so much its vastness (5 times as large as France) as its economic poverty and more than anything its population's complex diversity. In days of old, though already multicultural, it was entirely black, its population more or less christian from the 6th c. to the 13th c. Later, the interbreeding between the blacks and arabs and the islamizing were increasing considerably so much so that we can consider Sudan as having been arabized and muslim ever since the 15th c. Nevertheless, a non-insignificant number of Sudanese has stayed christian or animistic (African native religions) and almost lastingly intractable to the muslim government for centuries, particularly in the south. Arabic is the official language, but 32 African languages unintelligible to each other are also spoken. It is easy to imagine the conflicts which have continually occurred among so heterogeneous a society where grudges and fears have been borne from ancestral times. And yet, in Darfur, it is not a non-muslim rebellion against the muslim government that has brought about ruin and desolation, but it is a war between muslim tribes overlapping with a war between local muslim ambitious men, the tribes and ambitious men being at the same time fighting against Al–Khartum's muslim power...An islamo-islamic situation so much intricate that it is practically impossible to depict it in a small blog entry. I can only sum up what all of the witnesses sadly and unanimously report from Darfur: massacres, ruins and deportations. About Sudan as a whole I add that the Arab or arabized part of the population literally colonizes the black part still attached to their African roots. So Al-Qaeda, whose key idea is that Westerners should by fair means or foul be stopped from proceeding with recolonization of the muslim countries, is caught out in obvious hypocrisy in Sudan where Islam colonizes the non-islamized peoples. The metaphor of the straw and the big log (entries #0042 and #0043) can be applied to Islam as well as Rome and any place in the world. As if Al-Qaeda contradicting itself was not enough, or because they may have run out of arguments to prevent an airdrop of blue helmets who may well (though it's quite unsure) Darfur's agony, Al–Khartum accuses the Westerners of planning to re-colonize Sudan. As a result, NATO itself, the general secretary of which is a black man, Kofi Anna (from Ghana), does not like to intervene, so Darfur keeps on being devastated. Just the same, Al–Khartum government has tried to stop the Darfur war, but has been unsuccessful so far. Some people say that the government is the kalachnikov supplier to the Janjawib (in Arabic: the devil's riders) militia that kill and persecute the poor Darfurite civilians. But other people say no, it's untrue, the situation is so thick an obscurity that no one can determine where the weapons and ammunition come from and that all that happens is simply and tragically caused by bloodthirsty brigands who shelter behind the Quran. In history we have already seen a lot of criminals sheltering behing the Bible, or Marx...Sin travels throughout the world with a multicolored umbrella over its head. 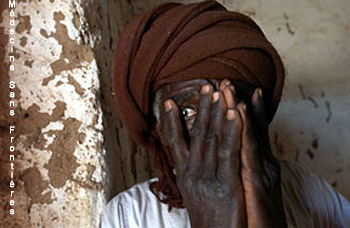 This sad situation might come to an and when all of Darfurites are killed or re-enslaved? Sudan like Iraq, Afghanistan, Lebanon, Palestine, Israel, keeps me awake.